Learn to avoid the #1 problem that plagues most online businessesan under-performing website. The rise in online shopping has led countless entrepreneurs to jump on the e-commerce bandwagonbut despite their big dreams and hard work, most fail. This book shows them how to succeed in grabbing their piece of the e-commerce pie. Forgoing get-rich-quick hype for best practices and solid marketing principles, two world-class online marketers offer an unbeatable 12-step system that creates a profitable and sustainable online business. Hundreds of proven strategic and tactics, as well as dozens of time-saving web resources, help you jumpstart the process. The authors reveal the 10 most common e-commerce mistakes and offer fail-safe strategies for avoiding them. Innovative automation strategies save you time and money and help you create new streams of passive income. Featuring current technologyincluding Web 2.0 innovations, web conferencing, podcasts, blogging and morethis comprehensive manual puts website owners on the road to profitability. 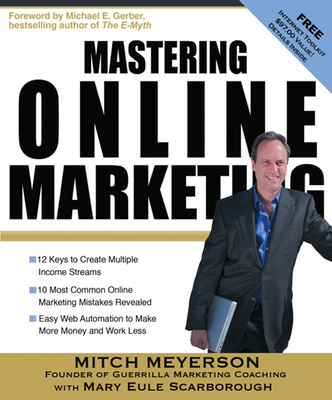 Mitch Meyerson has been a visionary and bestselling author and consultant for more than 20 years. He created the much acclaimed Guerrilla Marketing Coaching Program as well as other landmark internet programs including the Product Factory and Online Web Traffic School. Mary Eule Scarborough is a former Fortune 500 marketing executive and independent marketing consultant. As the founder of two successful small businesses, she holds unique insight into the marketing challenges entrepreneurs face.